List of cities in New Mexico – New Mexico is one of 50 states in United Statef of America. Its located in Southwestern Region of the US. New Mexico also become of the largest area states in US. Its capital is Santa Fe, while large city in New Mexico is Alburqueque. In this article, we will provide list of cities in New Mexico (city, town, village) by population size, sorting alphabetically. With a total area of 121,590 square (or 314,900 km2), New Mexico is fifth largest states by area in US. The population in New Mexico is, approximately, two millions. There are several different climate in New Mexico. While the northern and eastern is colder, the western and southern side is warmer. Due to its large area, New Mexico also used as oil drilling, mineral extraction and even as US militay base and nuclear bomb test in 1940s. Overall, there are 33 counties in New Mexico that contains 102 municipalities, including cities, towns and villages. The largest city by area and population in New Mexico is Alburqueque. In other side, the smallest city by area in New Mexico is Grenville and the smallest city by population is Grenville. Other notable cities in New Mexico are Santa Fe, Las Crucas, Roswell and Rio Rancho. Below are complete table list of cities ini New Mexico alphabetically along with its county and resident population size (city, town, village). 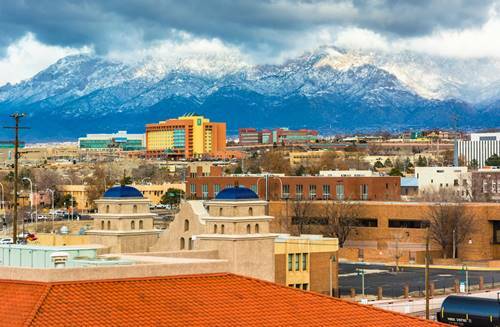 Overall there are hundreds towns and cities in New Mexico, including its capital Santa Fe and its largest city Alburqueque. New Mexico known as one of the largest states in US, but ironically its population size is the 15th least populous state among all.